First tried this Unibroue beer back in 2008 when I was living in Quebec City, when I first saw it on the shelves at the dépanneur, I immediately assumed this was a beer created by their owners Sleeman (pre-Sapporo) in the mid-2000s as a way to take on Molson/Labatt and increase their market share, but actually.. Unibroue's U line of beers were introduced back in 1998, 6 years before I ever tried my first Unibroue beer, La Fin du Monde. Most microbreweries release their takes on macro-style lagers and ales to be able to afford experimenting on stronger and connoisseur-loved beers, but in Unibroue's case, their Belgian-style ales ARE the cash cow, while the "U" line is essentially a discount brand only available in Quebec, where the 6-packs are under $10 for a 6 pack. In the Unibroue "U" line of beers, they have a Rousse red, Meil honey ale and the beer I'm reviewing, their Blonde pilsener. 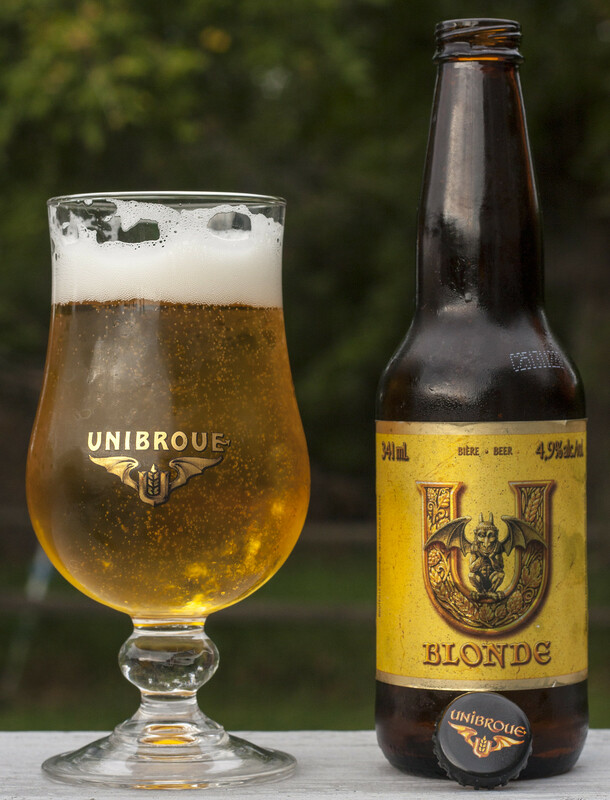 Appearance: U Blonde pours a very clear straw-golden yellow, thick snow white head, lots of microcarbonation like your standard lagers and pilsners available in North America, and a bit of a reminiscence of Unibroue's own La Fin du Monde. Aroma: The similarities of La Blonde to La Fin du Monde begin and end at the appearance. The aroma is very un-Unibroue, it doesn't have that standard sweet Belgian yeastiness that almost every other Unibroue beer on the planet has.. it has aroma of fresh cut barley straw, a bit of skunkiness and a sweet honey maltiness. This beer is reminiscent to a Labatt Blue or Moosehead Lager in many ways, the kind of beer that's around to cater the masses more than the geeks. The kind of beer you would drink around a camp fire. Aroma: Tastes of straw, a bit corny, and just like your standard Canadian lager/pilsner. Nothing really going for it, it's a very drinkable beer that would sell insanely well to the masses if they sold it here in Manitoba, but it's not the kind of beer that the typical Belgian fanatic like my self would drink on a regular basis. Then again, it's not a bad lager, but it's sure not Unibroue's best product.. but it's not their worst either (see Éphémère Pomme). Light honey sweetness, barley & grassy, light skunkiness, light metallic aftertaste, just like your standard campfire beer. Overall Thoughts: As I said, certainly nowhere from being Unibroue's best, but also not their worst. This is a big change from their standard Belgian-style ales that are well raved about all over North America. Very easy to drink down, especially after working the fields, but seeing that it's basically a buck-a-beer in Quebec, there's a reason it's around.. it caters to a different clientèle than say La Fin du Monde. Merci à Blacque Jacque Shellacque pour cette bière!